This happened in the arcade around the corner from the 2600 meeting. What, what’d you think I meant? I know, not an impressive score but it’s still the high score. 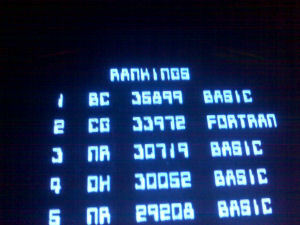 I failed to 0wn Galaga last night. I also failed to attend 2600 since there was a $10 cover charge to get in and I wasn’t willing to pay it. Would have sucked if nobody showed up and I was stuck in there watching a crappy band play all night.